Manage the e-mail attachments at your GMX mailbox. 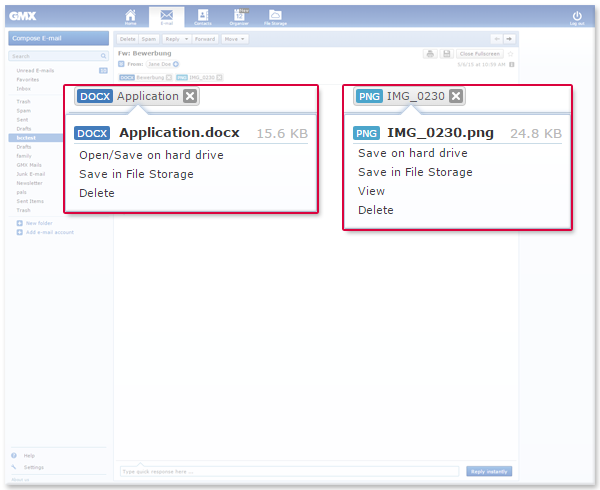 You can also save and manage those attachments at your File Storage. The maximum attachment size is 50 MB. An attachment is a file that is attached to an e-mail. Attachments may contain viruses. Open an attachment only if the sender is known to you and trustworthy. Open or save the file on the hard drive of your computer. Back up important files in your File Storage. The advantage is that your File Storage data is backed up professionally on many servers in the GMX data center. You can open texts, spreadsheets and presentations directly in your Online Office. You can view images, photos and PDFs right in your GMX mailbox.